Aug. 15, 2017 1:30 a.m. 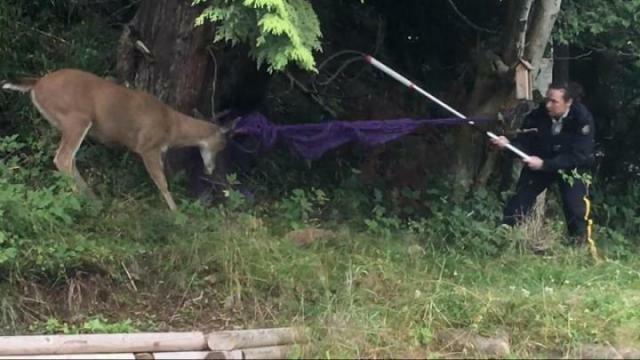 Prince Rupert RCMP struggled for 30 minutes Aug. 14 to free a wild buck tangled in a backyard hammock. At an 6th Avenue East home officers tried several times to calm and restrain the agitated animal but were forced to cut him free with a large section of twine still attached to his antlers. The buck was targeted with a taser gun only as a precaution as it fled into the woods. The nearest BC Conservation officer is based 140 kilometres east of the city in Terrace, requiring police to routinely handle wildlife incidents. More information to come from BC Conservation on the status of the deer.